At this moment in time – when it is economically more difficult to purchase a new car or truck and critical to produce them with optimum fuel efficiency – the pedal’s literally to the metal (and every other material selected) to deliver a whole bogie of complex vehicle performance benefits. Not the least of which is the latest US corporate average fuel efficiency (or CAFÉ) target of 54.5 mph in cars and light duty trucks by model year 2025. Getting there will likely involve drastic changes to vehicle design and manufacturing. 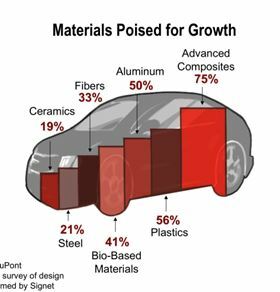 Based on what fibre reinforced plastic (FRP) suppliers tell us here, composites appear to be more in the automotive materials mix than ever before, helping original equipment manufacturers (OEMs) meet this moment. “The latest CAFÉ horizon will require quick and cost effective development of advanced materials, alternative propulsion systems and new technologies,” states Dr David Glasscock, Global Automotive Technology Director for DuPont, Wilmington, Delaware, USA. DuPont launched more than 1700 new products last year and invested 22% of its US$1.7 billion R&D budget on reducing fossil fuels dependence, new chemistry and materials. Certainly there’s been intense collaboration news in the past 36 months. Official joint ventures and other partnership arrangements announced between OEMs and FRP suppliers have included BMW with SGL Group, Daimler and Toray, Toyota with Toho Tenax, Audi with Voith GmbH, Evonik and CAMIMSA partners, and the formation of HIVOCOMP as part of the European Union’s Seventh Framework Programme. DuPont’s newest family of resins designed specifically in composites as an alternative to metal includes five grades of Zytel PLUS polyamide (PA) and two of Zytel HTN 92 series polyphthalamide (PPA). All utilise DuPont’s SHIELD technology, involving an enhanced polymer backbone and special additives package to withstand hot oil, calcium chloride, and engine temperatures to 230°C. Last October, General Motors adopted Zytel PLUS in a 35% glass-reinforced Cadillac engine cover within just 90 days of the resin’s commercialisation. The resin is also now being used in a reinforced exhaust gas recirculation system. DuPont’s testing of Zytel PLUS has demonstrated that the resins can double the lifetime of certain engine components as compared to standard, heat-stabilised polyamide. The HTN 92 series PPAs deliver performance a step above non-aromatic polyamides, with 1000 hours of oven age testing at 230°C showing 200% higher strength properties compared to standard PPA resin and 20-25% greater than polyphenylene sulphide (PPS) resins. Component candidates include exhaust mufflers, oil and transmission pans, oil filter modules, rocker covers and other transmission parts. Another family of Zytel HTN PPA resins is “electrically friendly” polymers that can withstand high voltage at temperatures, making them attractive for hybrid and electric vehicles. In China, DuPont is increasing its production capacity for Zytel HTN to 20 000 tonnes by 2013. For sheer volume in established FRP automotive parts, body panels and under bonnet components share this tally. Sheet moulding compound (SMC) and bulk moulding compound (BMC) materials with glass, mineral, nanocomposite and other fillers own the non-metallic body panels category, which includes Class A door and side panels, window surrounds, roofs, bonnet and boot covers, fenders and bumpers, spoilers, hard trim and other closeout panels. Bringing carbon fibre reinforcement to the SMC materials option will require collaboration with carbon fibre producers, according to both Dettre and Plaunt. AOC will continue to work with customers, OEMs and national laboratories to address carbon fibre cost and processability in SMC, while further developing SMC formulations with other reinforcements that provide lower density, low flame and smoke properties, toughness, and greener and more sustainable grades. This estimate is from Len Nunnery, Vice President of Global Marketing. Powertrain options also include electric and hybrid propulsion and BMCI has developed several new high flow BMC grades for the low pressure over-moulding of a variety of electrical components and sensitive electronics. BMCI also offers grades 940 and 955 for conductive bipolar plates used in commercial hydrogen fuel cells. It’s been eight years since the automotive industry handled the problem of paint pops on Class A body panels by developing toughened SMC formulations that could survive E-coat powder priming on the assembly line. Continental Structural Plastics (CSP) in Troy, Michigan, USA, trademarked and patented the Toughened SMC for Class A Applications (TCA™) tag in 2002 within its Budd Plastics assets, when participating in a consortium led by General Motors researcher Dr Hamid Kia. The company has worked extensively with AOC’s Atryl resins to produce a range of TCA formulations, as well as moulding TCA parts for GM such as hoods and decklids. “TCA definitely took us to a higher level of painting effectiveness,” states Probir Guha, general manager of CSP’s R&D and Materials. He started at Budd right out of graduate school and participated in prototype projects with carbon fibre SMC as early as 1977-78. CSP holds a number of valuable patents related to bonding, which Guha says affects the level of read through on a Class A surface as well as helping remove mass. The supplier also formulates and moulds composite material systems with thermoplastics and long glass, direct long glass, glass mat and BMC reinforcement for Class A, under bonnet, underbody, and structural components such as truck bed boxes. “Are we anywhere close to talking about more widespread use of carbon fibre SMC? Not at this point. Primary challenges with the material involve wet out and flow properties. CSP has considerable collaborative activity in place with OEMs, suppliers and major universities driving toward lower density structural and body panel composite materials." Within its full palette of thermoset resins for SMC, Ashland Performance Materials, Dublin, Ohio, USA, offers toughened SMC formulations for Class A panels. Based in its AROTRAN polyester, low-density and low mass SMC can feature nanoclay fillers and microsphere additives. The company’s Aropol PET-based resins are applicable for structural, non Class A SMC components – such as reinforced panels, cross car beams and grille opening retainers – that require high mechanical and impact properties and fast cure. The supplier’s Envirez soy-based bioresin can be formulated with filler for both Class A and non Class A auto parts. Composite underbonnet parts, as well as trim and non-visible components benefit from long and short glass reinforcement in engineered thermoplastics and Reinforced Plastics asked glass fibre supplier PPG, Cheswick, Pennsylvania, USA, what its 2012 growth potential looked like in this market. PPG’s TUFROV long fibre thermoplastics (LFT) and CHOPVANTAGE chopped glass strands have been in the automotive market for several years. Most recent TUFROV LFT developments encompass high performance, resin-specific grades, such as TUFROV 4510 fibre glass for PA-specific applications and 4575 for polypropylene (PP)-specific applications. “In the coming months, we will introduce TUFROV 4589 fibre glass for PE and 4585 for PET/PBT thermoplastic polyesters,” Marino says. PPG’s CHOPVANTAGE HP 3610 short fibre glass for PA and HP 3786 for PBT are used extensively in automotive components, and improved performance CHOPVANTAGE products in high temperature PPS and hydrolysis-resistant PBT are expected to launch by early 2012. Long and short glass engineered thermoplastic formulations from Borealis AG, Vienna, Austria, address the primary auto industry demands among its European OEM customers: light weight, fuel efficiency and emissions reduction, sustainability and recyclability. In NEPOL GD302HP, 30% long glass/PP replaces a hybridised polyurethane (PUR)/steel seat carrier for BMW, achieving 35% part weight saving and 15-20% system cost saving. NEPOL GB215HP with 20% long glass delivers 23% part weight savings and 20% system cost savings in a BMW instrument carrier. For Fiat/Lancia, Borealis’s XMOD GD301HP (32% short glass/PP) beat out glass/PA for total part weight in a pedal carrier, and demonstrated 16% part weight reduction compared to 30% glass/PA 66 in an air filter system. In a variety of Volkswagen models, the OEM switched from glass/PA to XMOD GB306SAF 35% short glass/PP in air intake modules to achieve a reduction in carbon dioxide emissions (CO2) of 60% as measured by external lifecycle analyses. Borealis won the Frost & Sullivan 2010 New Product Innovation Award in the category of Under the Hood Plastics for achieving system and production cost reduction and up to 15% weight reduction in the air intake manifold units made with this step-change PP compound. DAPLEN EF341AE 30% talc/PP reduces part weight over steel by 50% in the fenders for BMW X5 and X6 models, and enables 60% CO2 emission reduction based on external lifecycle analysis of these vehicles. Borealis is currently working on natural fibre fillers from sustainable, renewable wood in PP resin for visible and non-visible interior trim and underbonnet components. To meet projected growth in the global auto industry of 10% next year, LANXESS AG, Leverkusen, Germany, makes its own glass and high-modulus thermoplastics. Udo Erbstober, Communications Manager, reveals that the chemical company is expanding production capacity in China and India of its Durethan PA 6/66 and Pocan PBT+PET/PBT+PC resins. He says sales to automotive customers represent a 15% segment within total LANXESS group sales. To meet the lightweighting and higher engine temperature resistance needs of OEMs, Erbstober reports products from the company that include a hybrid composite/metal injection moulding process using glass/PA in sheet form. 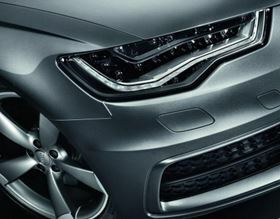 This has been commercialised in an Audi front end with 20% weight reduction over aluminium. Further innovations are expected with glass/PA 6 in components such as ‘hot side’ charge air tubes, fuel filters, and in larger, support components that can be highly glass filled and injection moulded. Within its glass/Pocan engineered thermoplastics, LANXESS is having success with utility vehicle tractor bumpers from PBT+PET as an alternative to SMC, as well as in truck panelling, fenders, wind deflectors, A pillars, and access steps. The Pocan PBT+PC blend has proven highly effective in the manufacture of an uncoated radiator grille for a Volvo construction truck model. These thermoplastics, as well as the hybrid composite/metal materials, are also finding positive demonstration in structural battery trays for electric vehicles, complemented by injection moulded glass/Durethan in battery covers and electronic housings. The Innovative Plastics strategic business unit within SABIC has been pursuing its own ‘automotive weight out’ with customers for some years. The company suggests that use of its resins could result in weight reduction of 24 kg from a typical car, and lower CO2 emissions per km traveled of 2.4 g. Over a fleet of 210 million vehicles, this translates to 9.6 million tonnes of polluting emissions eliminated annually. Achievements this year in particular components are expected to lead into further, similar applications on new vehicle platforms. SABIC IP’s STAMAX long glass fibre/PP replaced steel in the semi-structural front end module assembly (FEM) of Chang’an Automobile’s CX30 model, and in interior components for the Range Rover Evoque. The 40% weight cut in the CX30 FEM contributed to a 4 kg reduction in total vehicle weight, and to reduction of overall system cost as well because modular assembly was possible that boosted production efficiency. The FEM fully integrates the radiator, headlamps, lock bridges, and bumper beams, reducing 22 different metal parts into a single injection-molded composite part. For the Evoque, the STAMAX composite provides higher stiffness and lower density than alternative materials in instrument panels and inner door modules. The excellent flow properties of this long glass thermoplastic mean less material is needed to achieve strength/stiffness properties. 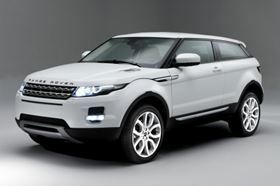 At 1600 kg, the Evoque is the lightest Range Rover ever built. The volume, supply, form, processability and price point of carbon fibre for high-volume vehicle platforms will be very different from the concept cars, low-volume supercars and alternative fuel vehicles, and Formula 1 race cars that have readily drawn upon carbon fibre reinforced plastic (CFRP) for weight, crash resistance, and aerodynamic styling advantages. 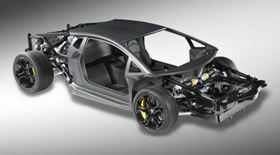 However, such special projects have made it possible to demonstrate wholesale replacement of the traditional metallic body-in-white (essentially the structural frame on which all primary vehicle systems are mounted) with a prototype carbon fibre/epoxy body-in-black. In 14 of his 20 years at ORNL, Warren has been part of the CFRP research team and helped establish the Oak Ridge Carbon Fibre Composites Consortium, which will hold its inaugural meeting this September. The goal of the consortium is to develop a carbon fibre grade that meets the cost target of $5-7/lb. “Lower cost carbon fibre will require entry into the market by new producers with a high volume commodity vision, and that is beginning to occur,” he says. Ventures in recent news bear this out: the formation of Zoltek Automotive (St. Louis, Missouri, USA) to produce intermediates from large-tow carbon fibre with the processability desired by automotive customers; the memorandum of understanding between Dow Europe GmbH and carbon fibre and acrylic fibre producer AKSA (Istanbul, Turkey); and the formation of SGL Automotive Carbon Fibres (Moses Lake, Washington, USA and Wackersdorf, Germany). Teijin Ltd (Tokyo, Japan) blew the lid off carbon fibre cycle time with its one minute press forming of parts equal in size to metallic body-in-white elements, and thermoplastic/carbon fibre intermediates to accommodate this process time. Plasan Carbon Composites (Bennington, Vermont, USA), an ORNL consortium member working on the lignin-based precursor, has developed an out-of-autoclave process that allows carbon fibre/epoxy component cure in 10 minutes. Another ORNL consortium member, Advanced Composites Group Ltd (Heanor, UK) is making inroads with its DForm (Deformable Composite System) slit prepreg that is cross plied into rapid laminating format so as to retain long fibre properties with the deformability of a short fibre moulding compound. The material can be press formed like SMC. Steve Cope, Automotive Market Sector Manager, says ACG has also demonstrated an automated production system emphasising robotic handling of highly conformable prepregs like DForm to achieve cost reduction, improve rate and repeatability in high-volume moulding of composite structural parts. A CHF30 million follow-on supply contract for Class A body panels awarded in May to prepreg and parts producer Gurit (headquartered in Wattwil, Switzerland with automotive composites facilities on the Isle of Wight, UK) utilises the company’s patented carbon fibre SPRINT CBS (car body sheet). First used in 2007, SPRINT CBS body panels feature carbon reinforcement around syntactic core and an in-mould primer layer. Low bake, light weight and high bake (200°C) variants are available. The unnamed OEM offering the most recent contract – through 2016 and with potential to net another 40% beyond the initial order – is likely Aston Martin. Toray Industries produces precursor, carbon fibre, fabric, preforms, matrix resins, CFRP intermediate materials and manufactures composite parts. In all these endeavours, the company emphasises life cycle management “in order to help realise a sustainable, low-carbon society by reducing the environmental impact over the entire life cycle of a product,” says Nobuyuki Odagiri, General Manager of Toray’s Advanced Composite Materials Technology Dept. in Tokyo. Over the life of carbon fibre and composite products, he explains, especially as used in lightweighting of cars and trucks, the environmental tradeoff of greenhouse gases created by carbon fibre manufacturing will be significantly less than the greenhouse gases (GHGs) saved in the operation of more fuel efficient vehicles. Maximising GHG reduction simultaneous to manufacturing productivity while reducing total parts cost led Toray to develop the Short Cycle Resin Transfer Moulding (RTM) process in 2006. As a participant within the five-year, government-funded Automobile Lightweight Structural Elements of CFRP Composites project, Toray scientists combined automated layup of 3D carbon fibre preforms with rapid-cure epoxy impregnation. Proof of concept parts included a door inner panel and front floor pan. “Achieving a cycle time of about 10 minutes, which is significantly shorter than for prepreg and about one-fifth the time required for conventional RTM, makes this a realistic technology for automotive parts manufacturing,” Odagiri concludes. He adds that further enhancement of the short cycle RTM technology in Toray’s joint venture with Daimler will be integral to the production of the OEM’s CFRP automotive parts. Collaborative engineering leads to competitive advantage, as new composite products that answer the needs of automotive OEMs are demonstrating. The software developers at VISTAGY Inc, Waltham, Massachusetts, USA, believe a predictive design tool that helps evaluate part producibility, performance and cost early on in the design cycle can only boost the effectiveness of collaboration. Bernardon and Steve Luby, VISTAGY founding partners, are familiar with the needs of high volume automotive composite processing since they created FiberSIM® after years as researchers developing manufacturing equipment for the fast forming and manufacture of composite parts and preforms in programmes such as the Dodge Viper. 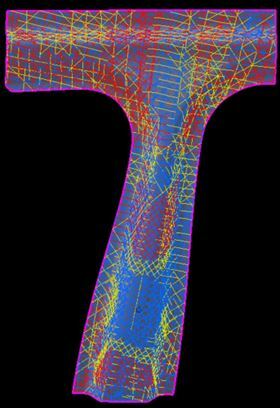 Automotive designers may find the comfort level afforded by such software a top priority, considering the sensitivity of design parameter changes on composite laminate performance. Magnetic nanoparticles as a microwave road repair additive. Motor racing has spawned or catalyzed countless technological innovations that have made road cars safer and more efficient. British bike manufacturer Orro has released the Terra C model road bike featuring sigmaIF – a combination of Innegra and Sigmatex carbon fibers.